Abhinavgupta, undoubtedly the greatest genius of India in the fields of philosophy's aesthetics, poetics, dramaturgy, Tantra and mysticis, is being rediscovered only in the few decades. Although several scholars, in India and abroad, are engaged in studying his works, it is surprising that there are still translations available. Abhinavagupta explains in his commentary that he undertook this work because he felt that his predecessors when commenting on the Bhagavad Gita had not understood its secret or exoteric meanings. With the main purpose to explain these exoteric meaning, Abhinvavagupta elaborates the secret doctrine of the purification of the sense organs through the alternation of enjoyment of worldly objects and deep meditation. He claims that the continuous exchange of two contradictory experiences, i.e., gratification of the senses, which brings satisfaction and samadhi in which sense organs are reduced to one's own atman, quickly brings the highest good. 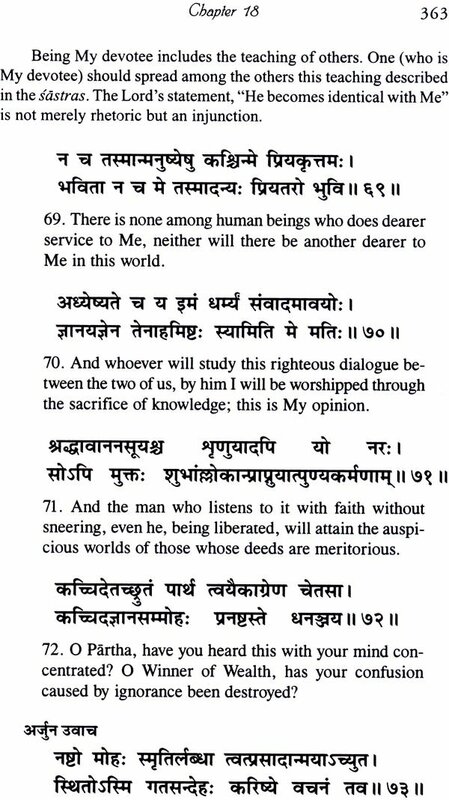 The great merit of the present translation of Abhinavagupta's "summary of the (real and secret) meaning of the Bhagavad Gita" lies in the following: First, it include the text and translation of the Kashmiri version of the Bhagavad Gita, which in places differs from the one commented upon by Shankara (there are fifteen additional verses, and many verses partially differ from the verse found in other recensions). Beside, it brings out the specific meaning in the context of Kashmir Shaiva Philosophy and yoga, without being influenced by Samkhya or Veedanta. The translation and explanatory notes show a deep understanding of Kashmir Shaiva metaphysics and yoga. The present work will fulfill an important role by presenting a different version or the Bhagavad Gita in the light of Kashmir Shaivism. It will also be inspiring for anyone interested in the practice of the secret yoga of the Gita. Gitartha-Samgraha, a little-known commentary on the Bhagavad Gita is presented to the reader in English translation for the first time in India. 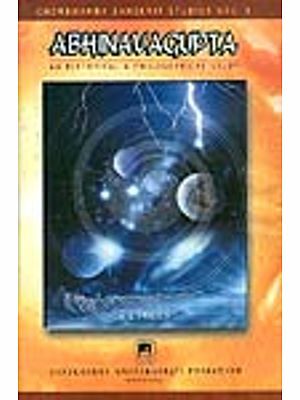 Though Arvind Sharma translated the text in English earlier, his translation is incomplete and not widely available in India. Prabha Devi, a lady scholar closely associated with the revered Swami Lakshmanjoo had been immersed in the traditional lineage of Saiva doctrine as it was in its heyday of vigour and success. Swami Lakshmanjoo was fully aware of its spiritual subtlety and philosophical excellence of thought. By the will of Siva, the Divine, a tradition of Saiva doctrine descended on earth and was fostered and nourished by numerous schools of the land. Lakshmanjoo belonged to this unbroken line of tradition and Prabha Devi, one of his favorite devotees received oral instruction from Swami-jee himself. 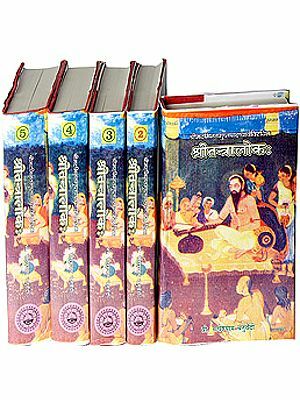 The Gita commentary of Sri Abhinavagupta was made available in Sanskrit, along with several other commentaries, by Nirnaya Sagar Press, Bombay, many years before. In addition to that, Swami Lakshmanjoo also brought out another Sanskrit edition of Gitartha-Samgraha from Chowkhamba Vidya Bhavan almost 70 years ago (1933), which has become very rare. It is a very happy and heartening occasion that Gitartha-Samgraha, and its English translation, is now being published and will thus be made available for scholars and students. There are many commentaries on the Bhagavad Gita-text. Most of them follow the tradition laid down by the great Samkaracarya, with emphasis on non-duality and on Brahman, the only Truth. While Abhinava's sole intention was on divinization and transmutation of knowable objects into consciousness. This was done with the idea not to deny the divinity of the external world, but to accept everything existing in this world as being composed of consciousness. When the Bhagavad Gita is studied in the light of other commentaries, the seeker's heart does not attain perfect fullness of satisfaction because here and there some hidden meanings remain out of sight; hence Sri Abhinava states, "Though a good number of commentators interpreted the Bhagavad Gita extensively, yet my effort is proper to bring into light the hidden meanings contained herein." (Mangala verse 5). "Samgraha means the means by which anything is determined. It is nothing but a means. I shall tell about that state by means of this upaya. In this context, I shall talk about the means for continuous practice." Sri Abhinava used to add samgraha verses in most of his compositions, like Tantrasara, Dhanvalokalocana and Abhinavabharati. The role of which is to bring a compact unity among all the statements. In one of his samgraha verses in Gitartha-samgraha we find the glorious view of the all-inclusive immanence of the Lord Divine; when realized the aspirant experiences that there is no such state, either within or without, where He does not shine. (chapter 8:11). The Kashmiri recension of the Bhagavad Gita is different at many places from other Gita recensions. Before Abhinavagupta, Ramakantha commented on the Bhagavad Gita elaborately, emphasizing the importance of jnana-karma-samuccayavada, the doctrine which gives equal importance to both knowledge and action. For Sri Abhinava also knowledge and action are not two different things. He writes: "The Lord who is consciousness  whose supreme nature is light, bliss and freedom  expresses-Himself in the entire series of creation, maintenance and dissolution. Even then, he does not lose anything as a result of this expansion  it is nothing but the state of agent, apart from which there is no question of doership. In the absence of that what are these actions? This being absent, with whom would be the result? Here the word karma means action and the result indeed is the result of action. For example, the movement of the stick and the wheel of the potter is not different from the very nature of the potter, and the action is not different from the very nature of the potter, and the action is not created by the jar for it (the action) is included in consciousness. Therefore, the conscious Lord indeed shines in different forms. Therefore, the existence of actions and their results as separated from the Divine is untenable. The Lord Himself shines as consciousness with his aspects as knowledge (drk) and action (kriya). Action and knowledge are not two distinct entities, but combined create a whole. (5: 14). Abhinavagupta was a great genius not only in the sphere of Saivism, but was through and through a saintly soul bearing a very keen insight which had reached the heart of truth. Whatever he touched turned into gold, whether it was a commentary on the Dhanvaloka of Anandavardhana or a commentary on the Natyasastra of Bharata. He became an accomplished scholar of eminence and rose to the height of Sadguru, the real guru leading seeker to attain the beatitude of the Divine. His works are many, and among them Gitartha-Samgraha is an important one. Many scholars are not well acquainted with the beauty and flavour of the Gitartha-Samgraha. Therefore, it is a very happy occasion that Boris Marjanovic has taken upon himself the job of translating this text with right earnestness in order to focus to the point what he has found in Sri Abhinava's composition, maintaining unity of thought (ekavakyata) from the beginning to the end. I thanks him for his strenuous effort and hope that the Great Divine may bring success in his life. 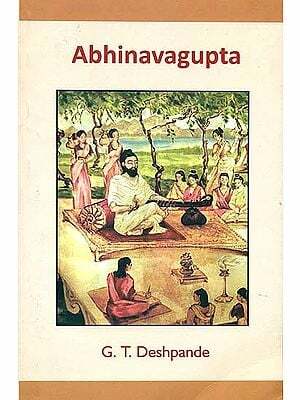 Abhinavagupta, undoubtedly the greatest genius of India in the fields of philosophy, aesthetics, poetics, dramaturgy, Tantra and mysticism, is being rediscovered only in the last few decades. Although several scholars, in India and abroad, are engaged in studying his works, it is surprising that there are still few translations available. Important texts still await a thorough study and translation. In this situation, the present work by Boris Marjanovic is a welcome step to fill this situation, the present work by Boris Marjanovic is a welcome step to fill this gap and to make available to a wider readership an important text: Abhinavagupta's commentary on the Bhagavad Gita. 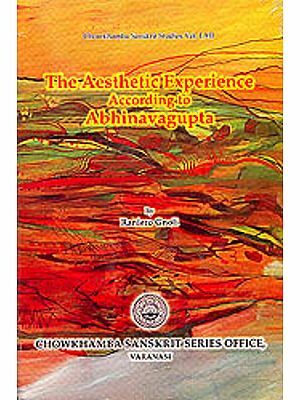 Besides a thorough knowledge of Sanskrit and Indian philosophy, the study and translation of Abhinavagupta's texts requires another qualification to understand their real meaning: an initiation into and practice of the spiritual tradition of Kashmir Shaivism. Abhinavagupta himself stresses this point time and again, and his great reverence and indebtedness to his teachers as well as his graceful attitude to his disciples for whom he is writing shows the importance of the continuity of the mystical lineage. , 18,2). He does not want to repeat the interpretations of his predecessors, such as Bhatta Bhaskara, and does not comment on the verses where the meaning of the text is obvious. For this very reason, he did not comment on each and every verse of the Gita's text. He is concerned with the essence of the teaching (cp. 18, 63), which is supreme non-duality (paramadvaita), and which can neither be satisfactorily explained by the dry philosophical system of Samkhya (18,67), nor Vedanta. He clearly states in his interpretation of 18, 63 that the knowledge taught by Sri Krsna to Arjuna is more esoteric than Vedanta (guhyat-vedantadapi guhyam). it is because the author was concerned with the essence of the Gita and not with its commonly understood meaning that the commentary is called arthasamgraha, and neither bhasya nor tika. But what is this esoteric meaning? 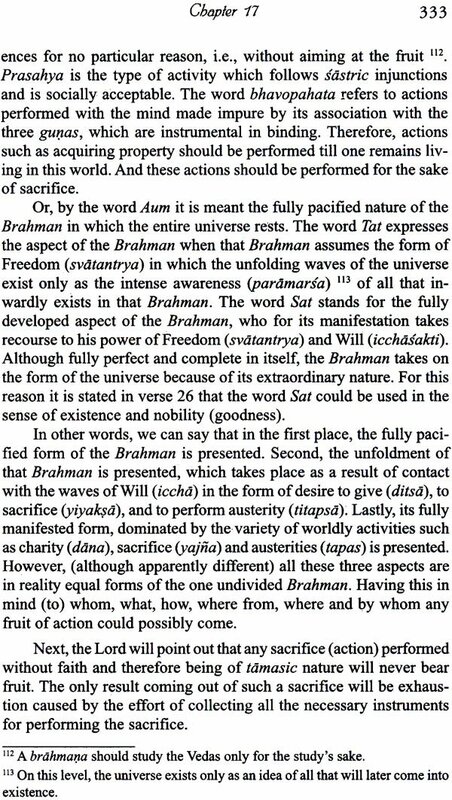 To give only a few examples: when in chapter 4 a kind of pranayama is taught, and it is said that prana is offered into apana, and also apana is offered into prana (verses 29-30), Abhinavagupta does not only give the yogic interpretation, where prana in the form of primordial sound (nada) is rising through the subtle centers of the yogic body, but he also gives a secret practice of initiation, where the apana (inhaling breath) of the guru. In this process, both guru and disciple attain liberation. Similarly, the different kinds of sacrifice are explained as an offering into the fire of one-pointedness, which is also interpreted in the light of a practice described in the Vijnana Bhairava: "This fire of one-pointedness, which is insatiated, is lit by right knowledge. The purport is that they grasp objects either (really) enjoyed or imagined by a one-pointed mind, while at the same time they turn away from all other objects." (4:27-28). By these esoteric interpretations in the light of Kashmir Shaivism, the Gita reveals a new dimension of spiritual practice or yoga. 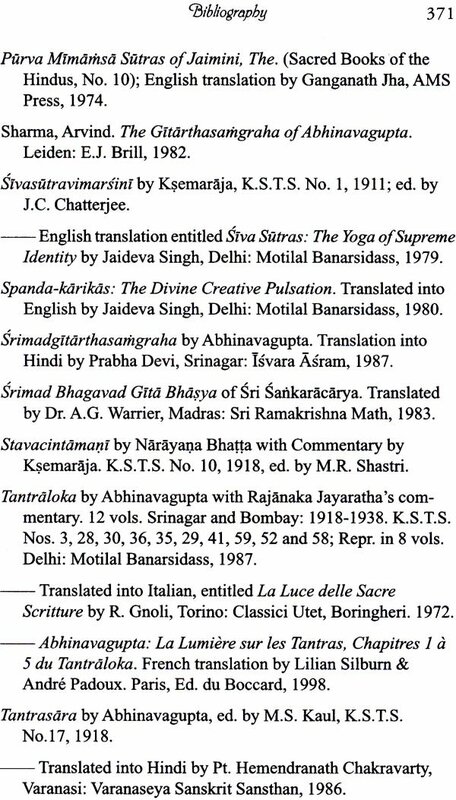 The great merit of the present translation of Abhinavagupta's "Summary of the (real and secret) meaning of the Bhagavad Gita" lies in the following: First, it includes the text and translation of the Kashmiri version of the Bhagavad Gita, which at places differs from the one commented upon by Sankara. Besides, it brings out the specific meanings in the context of Kashmir Shaiva philosophy and Yoga, without being influenced by Samkhya or Vedanta. 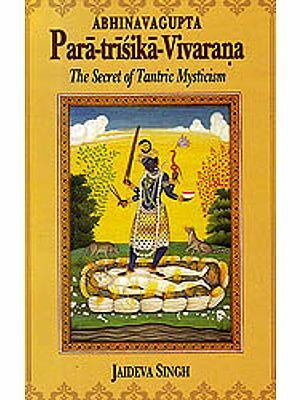 The translation and explanatory notes show a deep understanding of Kashmir Shaiva metaphysics and Yoga, thus standing out in contrast to an earlier translation by Arvind Sharma. 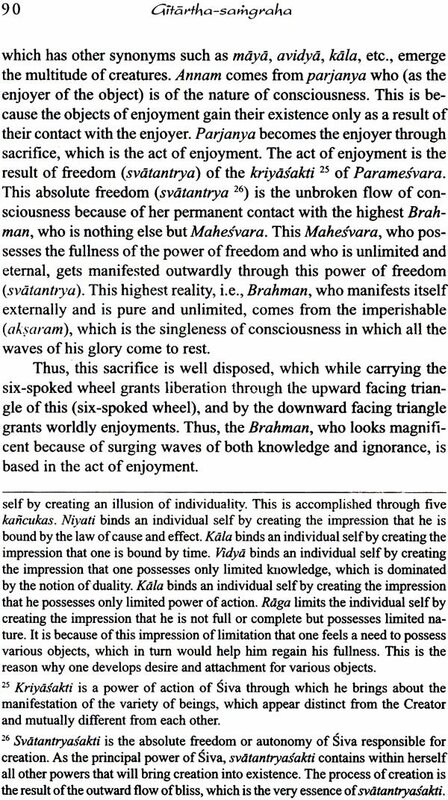 Arvind Sharma's study and translation lacks an understanding of Kashmir Shaivism and therefore often misses the point. For example, A. Sharma's translation of the same commentary (4:29-32) is confused and uncertain, because the traditional approach of Trika yoga is lacking. However, since Abhinavagupta himself has stated that it is not useful to point out the mistakes of other scholars, I am not attempting a comparison between the two translations. Abhinavagupta reveals the implications of the secret teachings of the Bhagavad Gita, which he calls a "great medicine". "Here I will stop revealing this secret because of the fear of saying too much and clearly revealing this secret. Although this verse (4,31) contains the highest secret, it can still be revealed to those whose elements are balanced by means of the great medicine in the form of tradition handed down by respected teachers when pleased by the service and deep devotion of their disciples." In the same context he proceeds: "In regard to this verse, other commentators have offered different commentaries. Their explanations and the explanation of my teachers should be analyzed by good-hearted scholars. What could be accomplished by pointing out the mistakes of others?" (page 126). The present work will fulfill an important role because it presents an original interpretation of the Bhagavad Gita in the light of Kashmir Shaivism. It will also be inspiring for anyone interested in the practice of the secret yoga of the Gita. The study of Sanskrit and Indian Philosophy has been a life- long aspiration for me. From the very beginning, I attempted to give the same importance to both intellectual understanding and the experience that comes as the result of practice. Ever since I 'discovered' Abhinavagupta as a graduate stu- dent at the University of Iowa, I felt an urge to understand, absorb and internalize his teachings. I was attracted by the lucidity and subtlety of his thought. His ability to clearly and in few words bring to the point all the depth of the spiritual experience is unsur- passed. His words made the innermost core of my being stir in its attempt to recognize itself. However, from the outset I was faced with the difficulties in studying Abhinavagupta and Kashmir Shaiva philosophy as a whole. I first came to Varanasi in 1996. At that time, I familiarized myself with the city and also started taking Sanskrit classes with teachers who emphasized the traditional method of teaching. It was then that I realized the vast opportunities found in this city for anyone interested in studying Indian philosophy or Sanskrit. Immediately after that experience, I moved to Varanasi and im- mersed myself in study of the sastras with the great pandits of this ancient city of learning. This book is the product of that study and is meant for both scholars and spiritual seekers alike. My sincere hope is that this translation will help those interested in the subject get a clearer understanding of the Gita text as well as Abhinavagupta as a scholar and yogin. At the outset I want to point out that this translation of the Gita text will differ in places from other English translations. The reason for this is that the Kashmiri recension of the Bhagavad Gita used by Abhinavagupta in his commentary differs from other avail- able recensions. First of all, the Kashmiri recension contains fif- teen additional verses. Some of the more interesting additional verses can be found in Chapter 2, verses 11 and 50, and in Chapter 3, verses 38-42. In addition to that, a great number of verses found in the Kashmiri recension partly differ from the vulgate or the criti- cal editions. The reader is advised to pay close attention to these differences, as sometimes they significantly alter the meaning of the entire verse. Furthermore, in my translation of the Gita verses, I closely followed Abhinavagupta's commentary and the mean- ings that he assigned to different words and expressions. There- fore, my English translation will at places be significantly differ- ent from other English translations, even when the Sanskrit text is identical in both recensions. In his book ABHINAVAGUPTA (p. 60), K.C. Pandey rightly points out that the reader of this commentary should be familiar with at least some of the main principles of Kashmir Shaiva philosophy in order to follow the ideas presented by Abhinavagupta. The follow- ing pages are meant for the easier understanding of those unfamil- iar with the Kashmir Shaiva philosophical system.